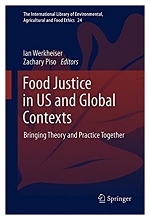 What do academics who work in the humani­ties and social sciences have to offer to food justice, if anything? An academic colleague and friend in civic studies once posed this question to me. The 33 editors and contributing authors who produced this book aim to offer concrete examples of potential answers to this question. However, none of these authors, my civic studies colleague, nor I are in a good position to lead Sustainable Agricultural Systems proposals for USDA’s Agricultural and Food Research Initiative (USDA AFRI). This new program area, announced in April 2018, will fund US$10-million, five-year projects that aim, for example, to increase use efficiency of three crop inputs (water, nitrogen and phosphorus) by 50%, reduce crop losses by 20%, or reduce food-borne illnesses to 8.5 cases per 100,000 Americans each year. These technical goals have clear and practical food production applications. The first two also attend to the right of future generations to have enough to eat. However, today they do little or nothing to promote food justice. Sufficient food supply is not a problem yet. However, inequitable distribution of the means of food production, exchange, and consumption are current problems; and within the U.S., this maldistribution closely, and unjustly, follows lines of class, gender, and race.